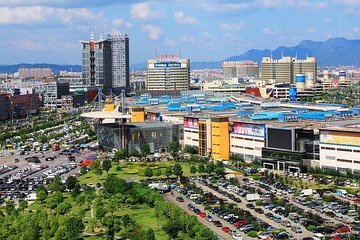 Take a day trip to Yiwu City, which is known for its lively markets and business community. A bilingual guide picks you up in Shanghai, then together you’ll catch the bullet train to Yiwu City. Your guide helps translate during any business you may have in the city, or perhaps you simply want to shop and sightsee. The tour is completely customized according to your interests. I along with my friend Rochelle, would like to express my deepest appreciation and gratitude to Viator team, especially Queena for the amazing experience curated for us today at Yiwu. I would definitely rate this a Five Star experience and would recommend it to whoever would like to take one. The timing of the tour was impeccable and prompt. Queena was gracious enough to accommodate our last minute ticketing change requests. Even at the wholesale market, Queena was enthusiastic to translate the language with the shopkeepers and also got us a pretty good discount for our products. She also arranged a very good lunch for us (despite our food restrictions). Overall, I must say, Rochelle and I didn't have to worry a bit about logistics as Queena made impeccable arrangements. Again, I would like to thanks to the team! Look forward to another trip soon!